L-R: PR account manager Scott Giles, PR account executive Georgia Pashley, PR & Marketing account director Jessica Wilson, PR account executive George Marrable. 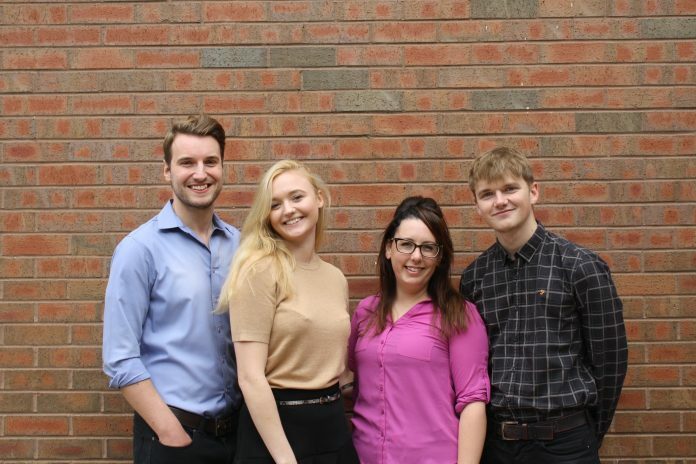 Midlands-based full-service marketing agency, Three Thinking Co., has announced the appointment of four new members of staff to complement its growing PR department. The news comes as the agency looks set to create a central PR, marketing and social media services hub across the East Midlands, with the firm recently opening new offices in Colwick, Nottingham to add to its existing headquarters in Anstey, Leicestershire. As part of the continued expansion, Scott Giles and Jessica Wilson have joined as PR account manager, and PR & marketing account director, respectively, with graduates Georgia Pashley and George Marrable also joining the firm as PR account executives in the past six months. With nearly four years’ experience in the PR industry, Giles joins Three Thinking Co., from Bristol-based agency, Antidote Communications, and brings with him a proven reputation of working with both B2B and B2C clients in a variety of industries. Wilson adds a wealth of strategic and international knowledge to the agency, having studied and worked across both marketing and PR in America before joining Three Thinking Co.
Marrable, a first-class media and communications graduate from Birmingham City University, has also joined the agency after undertaking a range of valuable work experiences within the journalism and PR sector. All four new members are working across a diverse range of clients, including renowned brands such as Marriott Hotels, Maxxis Tyres and Contract Furniture Group. Commenting on the agency expansion Paul Muckle, Director of Three Thinking Co., said: “It’s fantastic to have appointed a range of new members to the team, all with a diverse range of skills. Giles and Wilson joined us first, quickly integrating into the team and adding proven industry success to the agency. “We were then lucky to welcome Pashley and Marrable, both of whom are taking their first steps into the industry, bringing with them fresh ideas and a determination to help Three Thinking grow as a company. “These developments led to our new Nottingham base, which opens up a wealth of opportunity not only in terms of the clients we work with, but also in finding and nurturing creative talent.